Effipro Small Dogs is for dogs weighing less than 10Kg. Use Effipro for the treatment and prevention of infestation of fleas for up to 8 weeks and ticks for up to 4 weeks in dogs. Effipro can be used on puppies from 2 months of age and/or weighing more than 2kg. 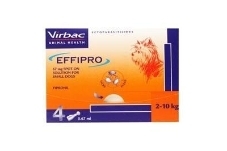 Effipro Small Dogs administration: by topical application to the skin, 1 pipette of 0.67ml per dog. Follow the instructions on the packet for correct application. Apply every four weeks to maintain flea cover. It is important to apply the dose to an area where the animal cannot lick off and to make sure that animals do not lick each other after treatment. Ensure that treated animals do not groom each other after treatment until dry.